The patient, nickname Pop, had various surgeries, in N. America in past. He is an Australia based patient of Asian origin. When he approached us, his scalp recipient area was mostly scar tissue. At the same time, the scalp donor was severely depleted. He had multiple scalp reductions and strip surgeries over the years. Pop is happy with the progress of his 1st stage repair and recently visited us for further work. Total 3983 grafts into scar tissues. It is worth pointing out, again, that the transplanted beard hair did not change their characteristic (color, sheen, calibre). More pictures and video to follow. Doesnt really look any better. doesnt look like most of thos grafts even grew. Must be something wrong with your eyesight. There is clear growth in barren scar tissue. Its remarkable to see beard hair growing in those scars. He said “most” not “all”. » change their characteristic (color, sheen, calibre). » More pictures and video to follow. Not even the length? Did the beard at least grow longer? » Not even the length? Did the beard at least grow longer? Since the patient doesnt grow his beard long, nor keep his hair very long, its not possible to say whether the beard hair would grow longer in its new location. However, its worth keeping in mind that the beard hair grows a couple of inches long in most people and it did grow that long in the scars. It’s hard to believe that some doctor actually did this to this guy, however I can relate somewhat. I wish this guy the best of luck, good to see an improvement. i don’t know dr.A …but i don’t see any improvement to this pacient only if you show as more pictures otherwise tend to belive that this transplant is a big failure. » » change their characteristic (color, sheen, calibre). » » More pictures and video to follow. Beard hair can grow very long, just don’t shave for a week and see for yourself. Dr. A, thanks your continuing diligence. You said the patient is Asian. I have never seen an Asian with chest hair or a beard. Do you mean he is Indian or East European Asian? Thanks. » Dr. A, thanks your continuing diligence. » or a beard. Do you mean he is Indian or East European Asian? Thanks. Asian in this patient refers to the Indian subcontinent. We try, as far as possible, to present comparable before and afters. However, its not always possible or feasible for the patient to accomodate our wishes. (The scars have not vanished; they have been filled in and broken. To shave would mean a long downtime for the patient as he waits for the hair to grow back). Pop had quite large barren scars. He is pleased with his progress as now none of the scars is visible to a casual observer. 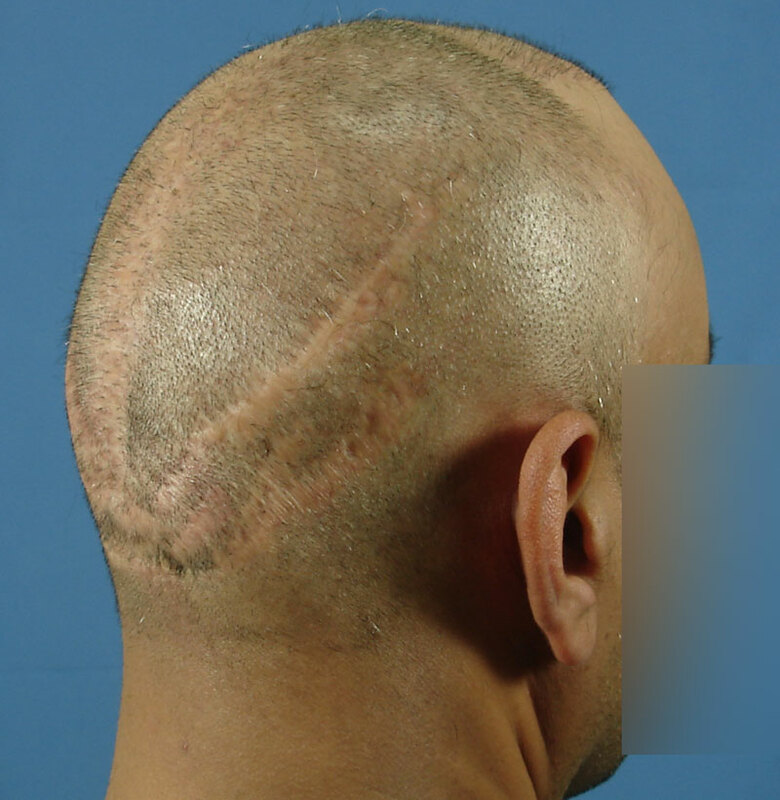 Hair were placed at low to moderate density to break the scars as the remaining scalp already has a low hair density due to being stretched by all the previous strips and scalp reductions. Here are a few graft placement pictures from 2007. » He is an Australia based patient of Asian origin. » When he approached us, his scalp recipient area was mostly scar tissue. » At the same time, the scalp donor was severely depleted. 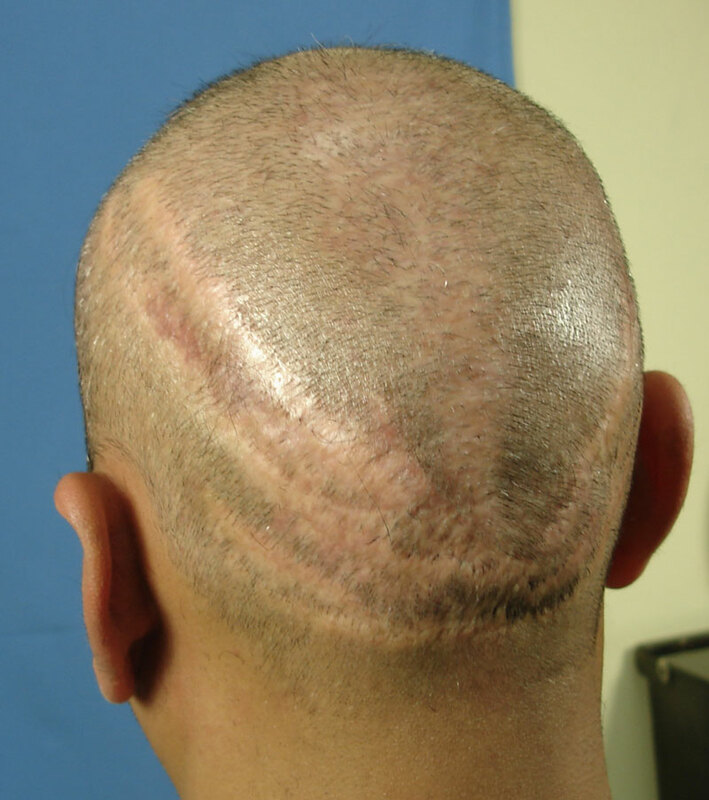 » He had multiple scalp reductions and strip surgeries over the years. » visited us for further work. » 17 from the thigh. » Total 3983 grafts into scar tissues. Wow, really feel for this guy. You pay and pay, and simply get butchered for your money. Nice atleast that Drs like Dr A are now able to give such victims some hope to look normal once again rather than mutilated. Had my second transplant last week. 941 head and 689 beard grafts. My first transplant focussed on the top. It was in a way to ascertain the growth etc. I am happy to say that all the transplanted hair grew in and there is no visible spots in the donor whatsoever. I have a dark skin so white spots on face was a major concern. This time round, grafts have been transplanted to join the previous transplant to my existing forelock. I want to thank Dr. Arvind, Dr. Ruby and their magnificent team. Please post my pictures with face blurred on a separate thread.